Today, August 3, 2016, is the 73rd anniversary of a tragic day for the Jews of south central Poland. 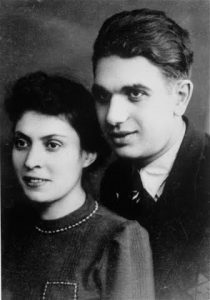 On August 1,2,3, in 1943, Jews in the Bendin Ghetto** were pushed out and deported to Auschwitz-Birkenau; for many, this would be the end of their lives. Today, seventy three years ago is the day when the Bendin Ghetto ended. The ghetto of the neighboring city, Sosnowiec, had already been squeezed into the larger Bendin Ghetto, as had the residents of a number of nearby towns. I receive letters from people who live all over the world, trying to find more information about their family or commenting about a photo in my book, exhibition or film. 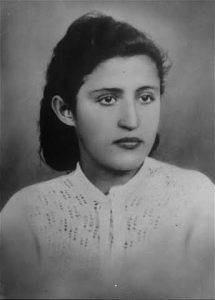 To mark this anniversary in a very personal way, I have asked the writer of a letter I received today for permission to share her detailed information about her grandfather, Majer Urmann, who was one of those Jews deported on this very day in 1943 from the Bendin Ghetto to Auschwitz. His granddaughter hopes to learn more information about her family and so, I ask for your help. Perhaps we will find an address? A story? A remembrance? If you know anything about this family, please write to me, and I will share it with her. Her letter and beautiful family photos follow. I share them with you, both in memorial to mark the end of the Bendin Ghetto, and in the hope that we may help the living. **Note: The Polish name of this city is Bedzin—but I choose to use the Yiddish name of the city, as did most of the Jews with whom I spoke, which is Bendin. My grandfather’s name was Majer Urmann, he passed away when I was only five years old but for some reason is a constant in my memories. He was kind, and quite. He actually worked as a tailor in the women’s fashion industry when he moved to America, and I now work in marketing within the same industry, I guess it runs in the blood. His father, Leiser, owned a lederhosen factory in Czeladz before the war began as well. From what I understand, my grandfather’s story goes as follows (and I apologize for so much detail, I am just hoping it is helpful). He was born in Bedzin (Bendsburg on all of his concentration camp documents) and lived in Czeladz. His eldest sister, Perl, was married to a man, Shimon Brzegowski and they had one son. His youngest sister Yittle, must have been around 15 in 1939. He had one brother, Solomon (went by Shlomik) who survived the war. My grandfather’s father as mentioned was named Leiser, his mother was named Rivka if I recall correctly. From what we know, when the war broke out Leiser was forced to become somewhat of a kappo. From the story I know, he was asked to create a list for deportation and could not when he saw names of family and friends, and he himself was sent to Auschwitz. I have spoken with Auschwitz at least twice in the hopes of finding out what happened to him, but to no avail. The most we know is that he took care of two young cousins in the camp up until his murder, and they had said they owed their lives to him. When he was deported, the family did not know where he went, he simply disappeared. His eldest, Perl, who was active in the Zionist movement, went to the police station. She told her family she was a woman so was not scared of being harmed. She too disappeared that day. They found out later she froze on a train. When Perl’s husband, Shimon, received the letter of deportation, my grandfather’s brother, Solomon went in his place. Solomon survived all of the camps he was in and later returned to Czeladz. 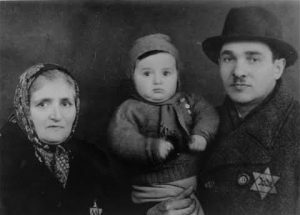 My great grandmother, Yittle, Shimon, and the baby were later deported (I assume to Auschwitz but we do not know). 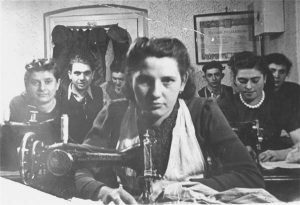 Shimon and Yittle were told to tell the Nazis they could cook and sew to show they could be utilized. When they saw they would be separated from their mother and his son, they chose to go to the gas chambers along with them. From the records I received, my grandfather Majer, was deported on August 3rd, 1943 from the Bedzin ghetto to Auschwitz. His prisoner number was 135128. Toward the end of the war he went on a death march to Mauthausen where his number was 119395. Mauthausen just informed me yesterday he was moved to a subcamp at Wels II, what my father knows as Ebensee. From the records it says he was deported from the Bedzin ghetto, but from my dad’s memory, he was in the Czeladz ghetto. I have attached the pictures we have left from before the war. They feature a portrait image of Yittle, a family picture of Perl, Shimon, and their son, and lastly, my great grandfather Leiser, my great grandmother Rivka, and their grandson. Lastly there is an image from the factory my family owned. My grandfather is the man on the right in the back. I am hoping these may offer you some clarity as perhaps you have come across their faces or pictures before? I so appreciate any insight you may have.